Protein supplements are all effective at helping you build muscle when consumed as directed by the manufacturer and after approval by your doctor. However, some types of protein may be more efficient at helping to build and maintain lean muscle mass compared with others. A major factor in determining how effective a protein shake may be is to look at its biological value. The BV of a protein is a measure of how well it is absorbed and utilized once inside your body. Whey protein offers the highest biological value of any protein. 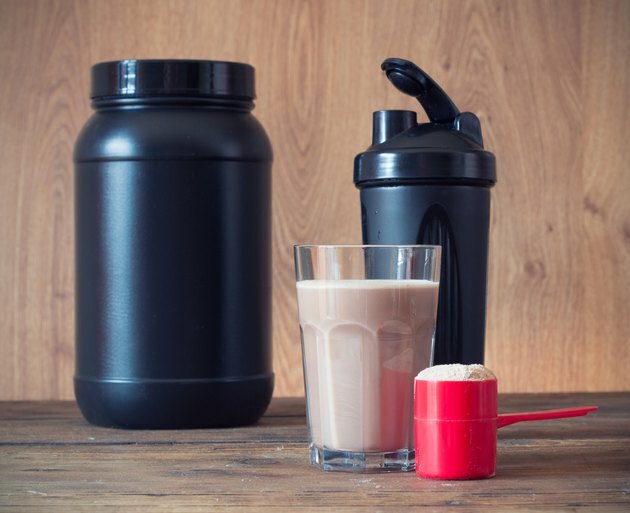 Three main types of whey protein supplements are on the market, according to the McKinley Health Center located at The University of Illinois. Whey protein concentrates are the least expensive and most popular choice, and these contain anywhere from 29 percent to 89 percent protein. Whey protein isolates contain 90 percent or more protein by weight, making a more pure form of whey protein. Hydrolysates are a partially hydrolyzed form of whey that is the most easily digested by your body but also the most expensive form of whey. Not all whey protein formulas are created equally, at least when it comes to its BV score. The BV of whey protein concentrates can be as high as 104, according to Bodybuilding.com. Whey protein isolates, however, can have a maximum BV of 157. This means whey protein isolate formulas may be the most efficient choice when trying to build lean muscle. Compare these figures to the max BV of meat, milk and eggs at 80, 91 and 100, respectively. Soy, casein and other protein powders do not have a BV exceeding 100. Leucine is an essential amino acid found in whey protein. It's in a class of amino acids known as branch-chain amino acids, which are vital to the muscle-building process. McKinley Health Center says leucine has been shown to help preserve lean muscle mass while at the same time promote fat loss. The result is a leaner, more muscular body. Whey protein contains more leucine than soy, egg and milk proteins. Consuming too much whey protein can lead to weight gain. McKinley Health Center suggests having 20 g to 25 g of whey protein shakes per day. You can divide this amount up into two or three separate shakes if desired, such as one in the morning and one after your workout. In fact, this may be the most desirable way to go, according to Helen Kollias, Ph.D. who's an expert in muscle development. She states the human body can only process 15 g of whey protein at one time, so two 10-to-15 g whey protein shakes per day may be the ideal regimen. Consult your doctor to be sure whey protein is right for you. Body Building.com: Protein Breakdown – Learn Which Type is Best for Your Goals!